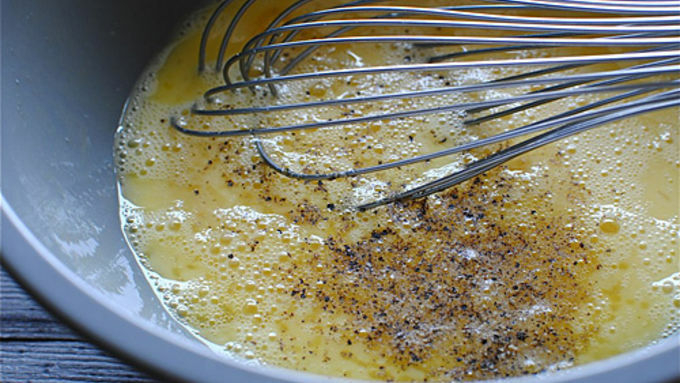 In a large bowl, whisk the eggs and season with a pinch of salt and pepper. 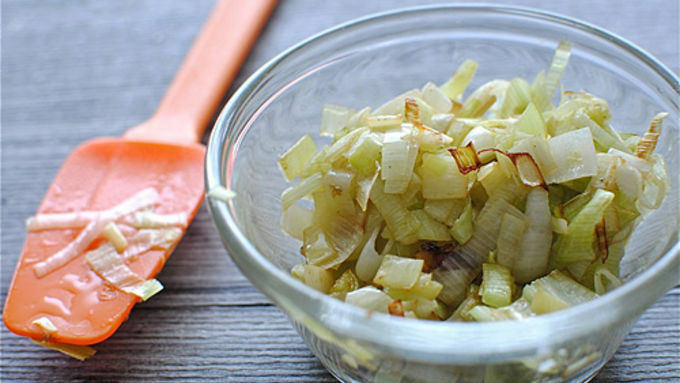 Heat a tablespoon of extra-virgin olive oil in a medium skillet and add the leeks. Season lightly with salt and pepper and saute until slightly browned, 3 minutes. Remove from pan and set aside. 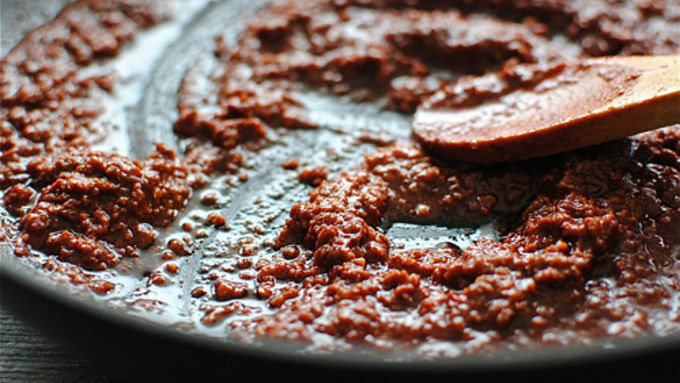 To the pan, add the chorizo and cook until until it's softened, 5 minutes. 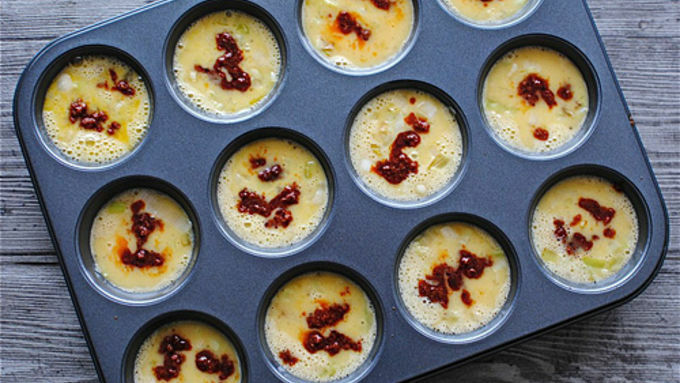 Pour the eggs into a non-stick muffin tin. 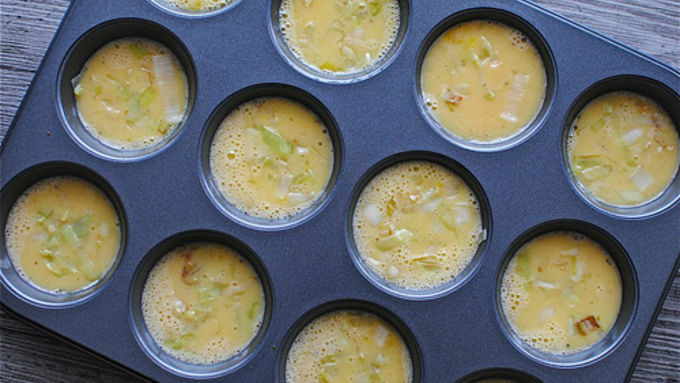 Sprinkle the leeks evenly into each eggy mixture. Followed by a good dollop of the chorizo. Go ahead and throw that spinach in there too. 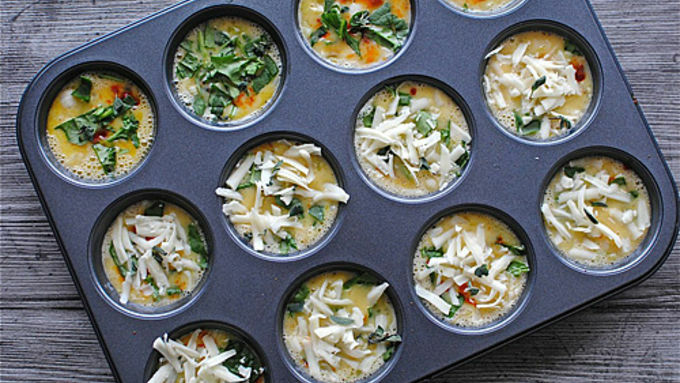 It would be wise to sprinkle some cheese and oregano on top of each frittata. Throw the whole thing into an oven, preheated to 375°F. Bake for about 10 minutes, checking at the 8-minute mark. They should be puffed up and set in the middle. Let cool a few minutes and serve at your next brunch! I've been on quite the miniaturizing kick lately. I've miniaturized calzones, chocolate cake, pecan pies and today I'm miniaturizing the frittata. Somehow miniaturizing my waistline didn't make the list. 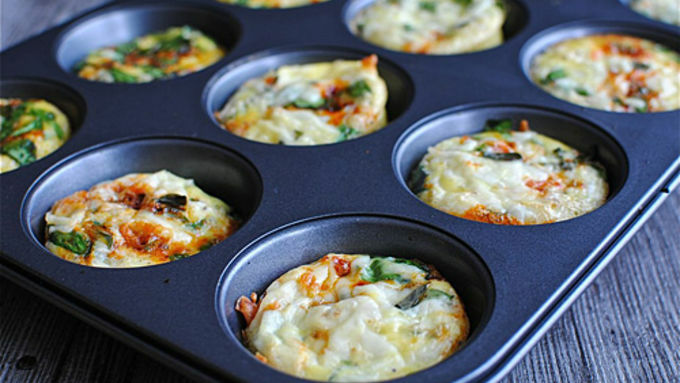 I have a major crush on frittatas. Or as I like to call them, "FREE-TA!-TAS!" 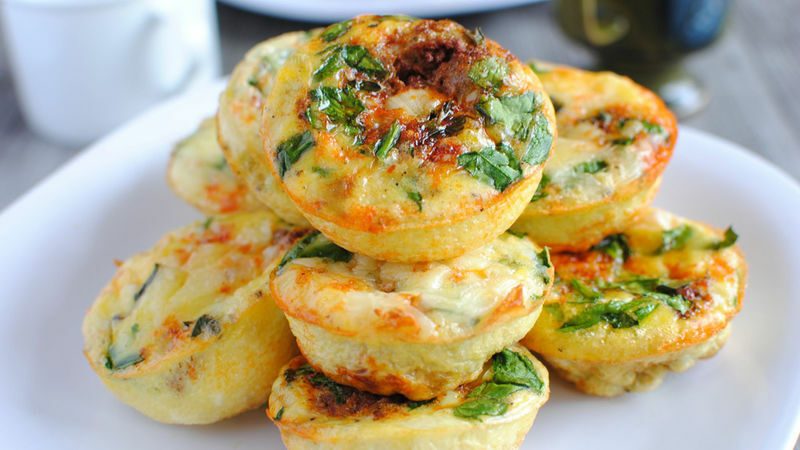 So when I decided to divide them up over 12 itty bitty muffin tins and pretend that I was hosting a brunch party with all my best friends picking out their favorite fillings and creating their perfect mini frittatas, I: A) got sad that it wasn't actually happening; and B) got really excited that I was going to have twelve mini frittatas to myself. Guess what? 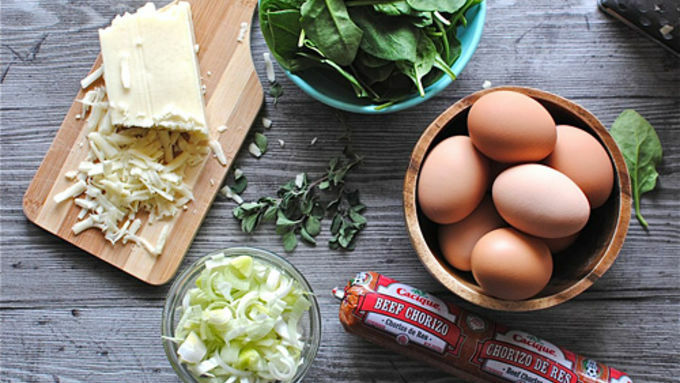 You have the power in your own hands to make this mini frittata brunch party happen. You do! Just round up a delicious topping fest, have a t.o.n. 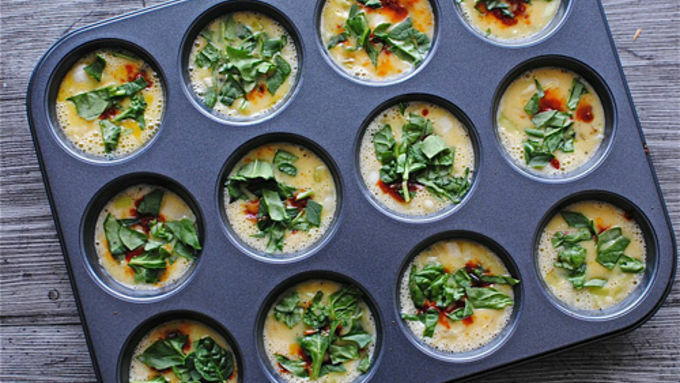 of eggs in a bowl and let everyone do their thang! Feel free to use a.n.y. topping you love: bacon, arugula, goat cheese, thyme, garlic, etc. Do it up! Just make it happen. Then invite me. Kthanksbye.